Multi-purpose studios 113–153m2 with sprung parquet flooring, offering ideal spaces for a wide range of events including rehearsals, casting sessions, workshops, conferences, seminars, meetings, interviews, community events and corporate functions. Located at the heart of the arts precinct in Southbank, the light and modern Melbourne studios are easily accessible and idyllic to host a personalised event experience. Artist in Melbourne Fringe 2019? Get your show festival-ready with 20% off studio hire at NIDA Melbourne. Include the name of your show in the ‘Notes’ section of the enquiry form below to claim your discount. Studios 1 and 2 are available for public hire and may be hired together or separately. Whether you are an independent artist, arts organisation, not-for-profit or corporate initiative, we are committed to providing a range of support services to ensure the event design exceeds your expectations. 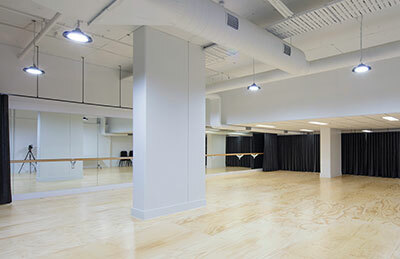 The studios are located at Creative Spaces: Guild, 152 Sturt Street, Southbank, Melbourne. NIDA’s Melbourne home is situated in the heart of the action at 152 Sturt Street in the newly launched Creative Spaces: Guild. Only a stone’s throw away from the CBD, we are close to all forms of public transport and easily accessible by foot and bicycles too. Parking: Metered public parking is available on the street. Alternatively, Arts Centre Melbourne offers parking at competitive rates and is located within easy strolling distance to the NIDA studios. Details can be found at the Arts Centre Melbourne website. For further information please contact the Melbourne Venues team on 03 8640 7080 or submit your Melbourne venue hire enquiry form. There is also a downloadable copy of our venue information pack available.